… the whole bird, and nothing but the bird. This week’s Freedom Ranger chicken delivered with my CSA pick up. We have been getting whole birds about every three weeks. It is an add on, and a very welcome one, to our vegetable deliveries from Lancaster Farm Fresh. 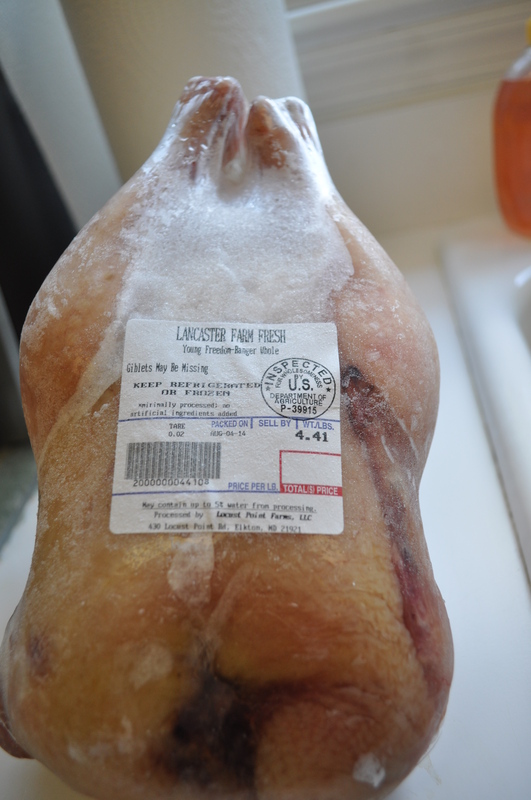 My freezer now contains only free range chicken, from either LFFC, or Friends and Farms, or England Acres. They may cost more than grocery store chicken, but to me, they taste so much better. I just have learned to eat less at a meal, and the increased cost is leveled out. 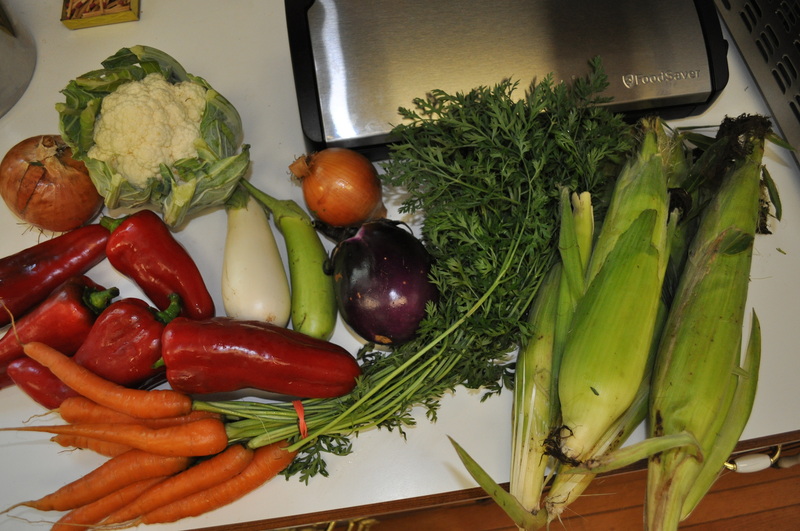 Besides our chicken, this past week we got the makings for some soup, now that the weather might actually cool down. I could do a chicken corn chowder using the corn and the cauliflower. I could do traditional soup, with those carrots and onions. I could roast the chicken like I did here. The red peppers, along with the two from Friends and Farms, were charred over the grill this morning. Put together with some garlic, eggplant, lemon juice, vinegar, olive oil, salt and pepper, they became my favorite dip for veggies or pita. Tomatoes, being served tonight with mozzarella and basil. Our fruit share this week was also a nice surprise. 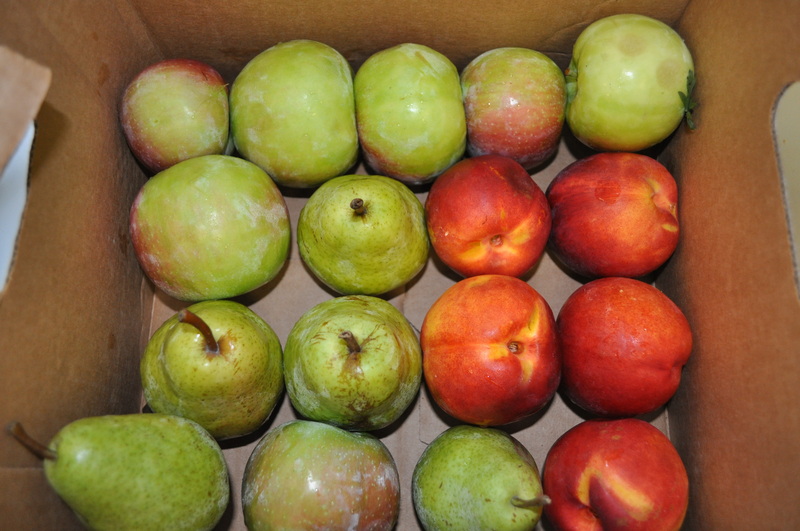 Bartlett pears, Jonamac apples, and nectarines. It really is getting late in the season, and we are loving the change in fruit and vegetables. Posted in CSA, Food, LFFC, Locavore, Weather and tagged cooking, CSA, Food, foodie, grilling, heirloom tomatoes, Locavore, real food, tomatoes, weather. Bookmark the permalink.